Travelers come to the vast Four Corners for awesome sights like Mesa Verde National Park and Monument Valley. 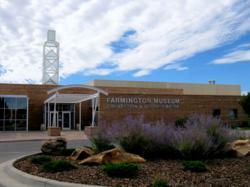 They also find a surprising number of cultural diversions in Farmington, the area’s commercial center and largest city. To find out what’s on tap go to the comprehensive list on the Farmington Convention & Visitors Bureau website. Beginning the first week of April they will also feature an “Event of the Week” on their Facebook page. “Gateway to Imagination,” a national juried art show, featuring artists from across the country opens at Farmington Museum in Farmington, N.M. on May 12. The City of Farmington has long been supportive of arts and culture, “casual and easy going, they made it happen,” says Scott Hagler, local musician and leader of arts initiatives. The City of Farmington has long been supportive of arts and culture, “casual and easy going, they make it happen” says Scott Hagler local musician and leader of arts initiatives. San Juan College in Farmington annually offers a series of lectures, concerts and plays. At the Civic Center downtown there are Broadway musicals and plays and at the state-of-the-art Farmington Public Library there are lectures and film classics. Works by local and regional artists are in galleries and trading posts in the historic downtown area, and often featured at the Farmington Museum at Gateway Park. The Totah, a renovated movie theater, is now a 300-seat cabaret bringing in shows and available for rent on Main Street downtown. Quarterly art walks are held in the downtown streets. In the bluffs to the north of the city, each summer season there is a colorful outdoor theater production in the Lions Wilderness Park Amphitheater. This summer “Fiddler on the Roof” is playing. April 13, Spring Art Walk in Downtown Farmington on Friday, 5 to 9 p.m. sponsored by the Farmington Downtown Association, art receptions and open houses at many downtown locations. April 22, San Juan Symphony Concert, Beethoven’s Pastoral Symphony, also pianist Zhu Wang playing a Mozart concerto, San Juan College Henderson Fine Arts Center 3 p.m. Tickets: $30 Adults, $15 Senior (65 and up), $8 Students (18 and under). April 27, Ann Beyke portrays Margaret Sanger: The Woman Rebel, part of a Chautauqua history series, San Juan College Little Theater, 7 p.m.
May 12 – July 14, Gateway to Imagination National Juried Art Show, an annual show with artists from across the country, Farmington Museum, 3041 East Main St.
Farmington Convention and Visitors Bureau offers travel information about attractions and accommodations. Go to their website or call their toll free number, 800-448-1240, to learn about the many things to see and do in the Four Corners.